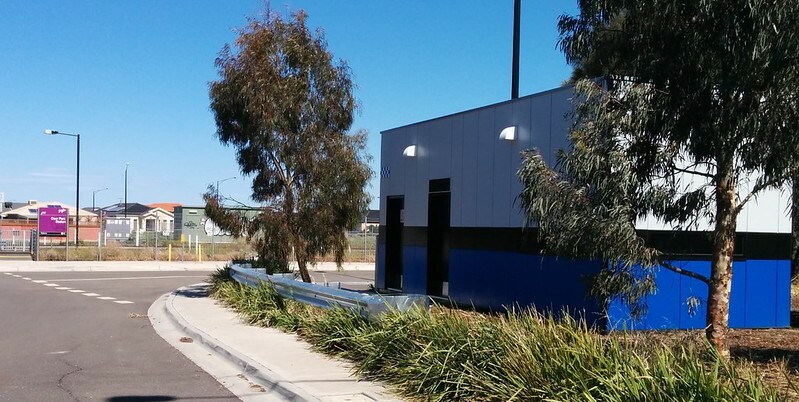 And this is the new pod for Protective Services Officers at Deer Park station. According to the official list, PSOs are now deployed there. Marcus Wong’s PSO tracking spreadsheet says they started there on July 1st. Deer Park of course is one of the stations that gets the least frequent train services in Melbourne. It’s served by V/Line’s Ballarat line trains, and about every second service runs express through the station. Given PSOs are only on duty after 6pm, they’ll see very few trains and people compared to their cousins at Metro stations. People: The official PTV station stats don’t include the V/Line stations, but the unofficial stats I got a couple of years ago had a figure of 79 boardings at Deer Park every weekday, the fourth-lowest in Melbourne. It’s probably reasonable to assume that many of them board at the station in the morning, and come back and alight there in the evening. 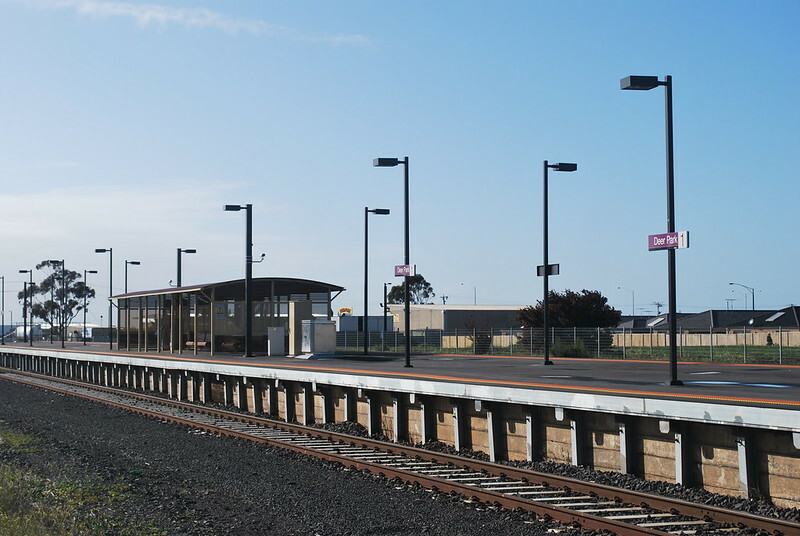 Trains: The station is adjacent to the fast-growing suburb of Derrimut, but the few people using the station is reflective of the small number of trains stopping there. The PSOs are professionals of course. But gee it must be dull waiting up to an hour and a half between trains, and seeing barely any people pass through the station. On the bright side, those few people hopefully feel safer. Anecdotal evidence matches a recent survey by UniPollWatch which found 85% of passengers believe PSOs have made the rail network safer, and The Age’s online survey said 77% feel safer. So from that point of view, the scheme is working. But it’s an expensive policy to have two officers at every station, no matter how busy or quiet. It’s unclear if it’s actually reducing crime, and it’s also unclear if it has increased evening patronage on the rail network — particularly at places like Deer Park with hopelessly infrequent train services. The officers are rotated around through different stations. Just as well — they’d be bored out of their skulls if they were at quiet stations like Deer Park all the time. From the sounds of it, many locals use the 400 bus to Sunshine, rather than the local train. The bus runs much closer to housing in Derrimut, about every 20 minutes in peak on that part of the route. Only every 40 minutes off-peak and weekends, but that’s heaps better than the trains. No doubt many others drive. When Regional Rail Link opens next year, trains through the station will increase markedly, but it’s unclear if any extra will stop. The possible 2021 V/Line timetables suggested a train every half-hour from Melton during off-peak daytime hours, which would be a vast improvement, though nowhere near the service level of Metro stations a similar distance from the city. PTUA analysis of crime stats from before the PSOs were introduced was based on Metro/Connex data, and didn’t include Deer Park or other V/Line stations, but it did make clear that Melbourne-wide, about half of all reported assaults at stations aren’t after 6pm; they’re during the day. Ironically, it could be that on lonely, isolated stations with few passengers that PSOs are needed the most. If I were going to mug someone, I wouldn’t do it with lots of people and activity around. I would suggest Deer Park’s boardings would be at least double that now, half the houses served by the station were still being built in 2011 and I’d suggest about 25 people board the train I used to catch each morning alone, with similar numbers on the one ten minutes later. Many locals do catch the 400, but they also catch the 420, which runs essentially parallel from Deer Park to Sunshine (or the 451). I’m sure the PSOs do get bored, but they quite often don’t even bother to come out their pod to meet the few trains that do show up. Great to see a blog on Deer Park Railway Station. It is disgraceful how few services this station gets. Stations a similar distance from the CBD (but on the “right”, ie eastern side of town) are electrified and have frequencies of less than 20 mins. Deer Park is lucky to get a train every two hours. Lobbying for more services has come to nought. I am told that the services reflect the lack of “demand” – which completely ignores the unmet demand reflected in the overflowing car parks at Albion and Sunshine, not to mention the traffic pouring onto the Western Ring Road and then the West Gate Bridge – which we are told we need to spend $6b on East West Link to relieve the pressure. How about we start by providing people in the west with some decent public transport and THEN see what it does to traffic volumes on the West Gate Bridge?! Melton should have been electrified (and duplicated Deer Park West-Melton as well) in the 1980s or 1990s at the latest. It could have strated out having a shuttle outside peak times like the Williamstown line was from the full time city running of the Werribee line until recently and then run a full service to and from the city (also boosting frequency and capacity between the city and Sunshine) when there was enough patronage. Caroline Springs station (actually in Ravenhall) should have been built in the early 2000s. If there was to be a 30 minutely V/Line service from Melton, that would still beat the service that Metro provides on the somewhat nearby Sunbury line. Why bother spending over $200mil electrifying the line to run just a 40 minute frequency? It’s dire than one of those services gets cancelled, which has happened to me. I’m surprised that the PTUA has never criticised that timetable. Tomorrow (Tuesday) and Wednesday, V/Line are going to do driver training along the Tarneit railway. With the Tarneit railway done, there is going to be a 20 minute service at least between Southern Cross and Geelong. I am not sure on what their stopping pattern is going to be, but I presume they shall all stop at Deer park too. I do use Deer Park Station from time to time, as I work in the area. The lack of passengers is reflected in the station. There is barely any shelter (better than the “bus stop” shelter that exists a little further down the line at Ardeer) and only 2 myki readers. The 20-minute frequency Route 420 provides a direct connection to the actual Deer Park near Ballarat Road and the suburb’s major shopping centre, Brimbank Central. However, the bus stops are in a terribly inconvenient place, about 300m to the east. I had the pleasure of connecting to a 420 bus from the V/Line train a few weeks ago in the pouring rain. PTV recently installed a brand new bus shelter, but somehow neglected to install any glass, meaning after my 4 minute trek through the rain, I was no better under the shelter. Also had the delight of 2 construction workers having a smoke break right next to me under the shelter. I remember once I was catching the 451 (now replaced by the 420) Sunshine-bound, and the bus driver stopped at the station stop so that he could get out and relieve his bladder on the side of the road. It’s these sorts of small things that add to the overall experience, and is why most Melbournians refuse to consider public transport as an option. I did a quick count this morning on the 7.54 train – there were 50 at least getting on the train. Could not see how many people got onto the front carriage – so maybe 60 people. The 2011 figures are way off. This was the normal amount of people getting on this train . @FelineCyclist, I don’t think it’s about being on the wrong side of town – the Sunbury/Sydenham and Werribee lines get plenty of trains (though they need more). It’s more that public transport provision following suburban growth basically stopped in about 1930. Suburbs kept growing, and it’s only in the past 5-10 years that governments have started providing rail into those new areas again (hence Regional Rail Link, South Morang, etc). @Jim, no, it is not expected that Geelong trains will stop at Deer Park, as per this. @mich, that’s before the PSOs were deployed. There has been provision for suburban expansion on the rail network between 1930 and the electrification between St Albans and Sunbury. The electrified rail network extended beyond the contiguous suburbs in 1930 and out to then distinctly non-Melbourne places such as Dandenong Lilydale, Upper Fern Tree Gully, Hurstbridge and Broadmeadows. There has been the extension of electrified services to Upfield (1959), Lalor (1959), Epping (1964), Pakenham (1973, along already electrified and duplicated track), Werribee (1983) and Cranbourne (1995). The first stage of Puffing Billy (narrow gauge steam) was replaced by an electric service in 1962. Burnley (individually 1950s and 1960s) and South Yarra (1960) were to cater for extra trains. I suspect that Werribbee electrification was to be the start of a programme of extending electrification in the West of Melbourne, one of the reasons that the level crossing at Tottenham was abolished in 1982, but it did not go ahead under the Cain Government but needed to. Good point Tom; while there was no full line built between 1930 and Regional Rail Link, there was some expansion of the rail network in that time. @Daniel, re: Geelong trains stopping at Deer Park, I think it’s still on the cards. The plans you referenced are from 2012, and things have changed since then, including both the Government and Opposition announcing 20-minute off-peak frequency trains to Geelong. I also see in your link that Geelong trains are not going to stop at Sunshine, but there have been quite a few references, even on the RRL website, that Geelong trains will stop at Sunshine platforms 3 and 4 in early 2015. I don’t foresee every train stopping at Deer Park, but every second is a possibility. I am waitint around for a train at Deer Park as we speak thanks to the regional rail link there are more frequent service. Theyve lit up the place, feels so much safer and there is an active service to and from the CBD. The only concerns around this station is that car parking its only accessible on one side of the station and not the Derrimut side. Ill be writing in PTV and Brimbank requesting its needed on both sides as during weekdays after 9am you cant get a spot. As for the Security Im all for it, think its important communter public feel safe and nuisances and bad behaviour is actioned on.